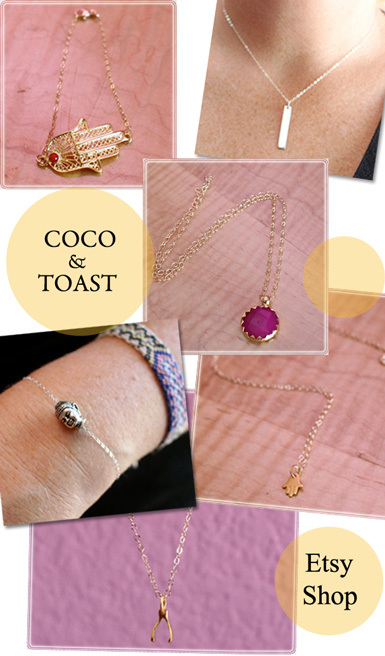 belle maison: Etsy Shop: Coco and Toast + Giveaway! Etsy Shop: Coco and Toast + Giveaway! My bestie Erin (been friends since 2nd grade) opened up a sweet little Etsy shop last year called Coco and Toast, where she sells her very own collection of hand crafted jewelry. 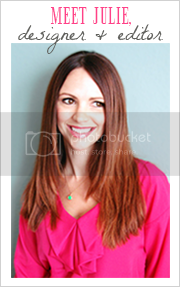 I'm a huge supporter of small business owners, especially stay-at-home mommies like Erin! She works so hard taking care of everyone else yet somehow finds the time to follow her creative passion. See details at the end of this post on how you can win a bracelet from her shop! I appreciate all your jewel but The most I like is the gold birdy bracelet. Erins pieces are adorable! I'm loving the wishbone necklace. I absolutely love the the moroccan inspired Magenta Jade Pendant. It would look stunning on all my bridesmaids in the wedding next summer! You have a beautiful talent, thanks for sharing! I loveee the wishbone necklace. I've been wanting one for years and this one is perfection. Thanks for the chance to win!!! The Magenta Jade Pendant Necklace is gorgeous! Also like the Dainty Gold Bird Bracelet and Gold Evil Eye Bracelet-- would be great pieces as necklaces too! Love the dainty/gold jewelry designs Erin! I really love the gold Evil Eye bracelet! Gorgeous! Love the Buddha pieces, of course, and the evil eye bracelet. LOVE LOVE LOVE the Gold Evil Eye Bracelet---absolutely fabby! The Magenta Jade Pendant Necklace caught my eyes first-vibrant and heavenly! The jade has such a strikingly radiant color that makes this necklace come alive. It is a clear choice for someone who wants a unique quality piece that will make them feel special and will demand attention. I see myself and others enjoying this lovely necklace! The dainty gold bird bracelet is just wonderful. It would make the perfect finishing touch to many outfits. The tiny golden Hamsa necklace is right up my alley! I love the Magenta Jade Pendant necklace! I especially love how it was set and the triangular shapes do remind me of the sun. Hi, I love the Buddha bracelet, adorable. I Love the Buddha bracelet. Very beautiful work! My favorite piece is the gold evil eye bracelet, it's so unique and special! Ofcourse I also love the little buddha bracelet! I love the gold bird bracelet - so pretty! I really love the dainty gold wishbone necklace, it's really subtle and stylish. 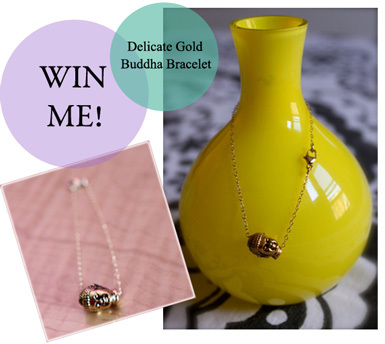 I adore the Delicate Gold Buddha Bracelet - so beautiful! Obsessed over the silver wishbone! Been looking for dainty necklaces that I can layer over each other... I have found the perfect Etsy shop! That bird bracelet is lovely! I absolutely love the dainty bracelets and the wishbone necklace makes me smile. I would absolutely buy the delicate gold buddha or the dainty bird bracelet! Great shop : ) I live THE necklace with the little silver hand solo cute! It was hard for me to pick my favorite but I do love the Dainty Gold Bird Bracelet!